Police recover stolen senate mace – Royal Times of Nigeria. 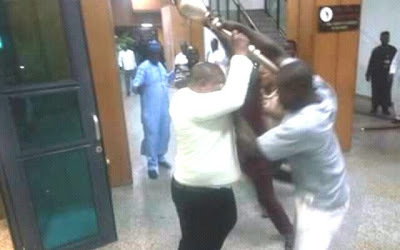 The Nigerian police said they have recovered the mace that was stolen from the senate on Wednesday. According to a statement signed by the deputy public relations officer in the police headquarters, Aremu Adeniran the police said they recovered the mace where the hoodlums abandoned it. He, however, said discreet investigation into the incident is still ongoing to arrest and bring the perpetrators to justice.